Pricest exclude VAT and are subject to alteration without notice. Orders are subject to availability, and goods will be invoiced at the prices ruling at date of despatch. As part of our policy of continuity, we reserve the right to make any alterations in designs shown in our catalogue if we feel this is necessary. Where special packing is required this will be charged at cost. Free delivery on orders over £60.00 nett. A delivery charge of £7.50 will be levied on orders under nett values of £60.00. Or £12.50 will be levied on orders under nett values of £30.00. Only the higer charge of the two will be applied. A delivery note is sent with all consignments. All deliveries sent should be carefully examined before being signed for as “ received in good condition”. In accordance with Transport Regulations, claims for loss, damages or shortages must be made in writing within five days of receipt of goods. Non-arrival of goods should be notified in writing within fourteen days of invoice date. Strictly nett by the 20th day of the month following the end of the month in which the invoice was raised. We reserve the right to add a charge of 5% per month interest on overdue accounts. 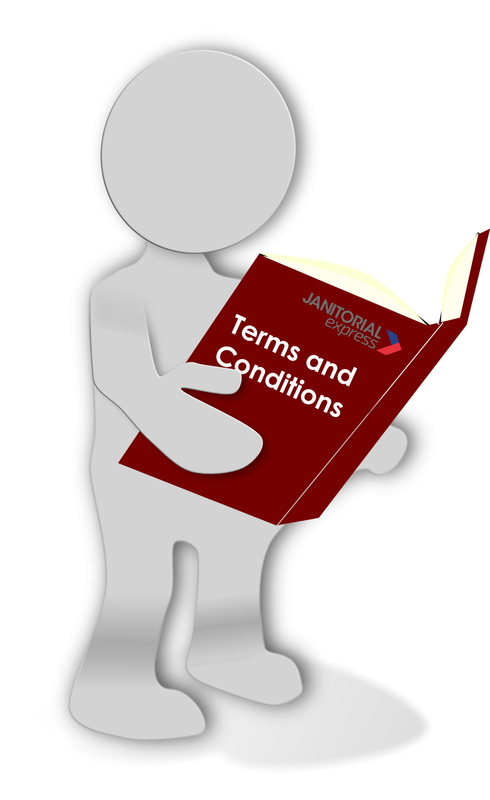 Until Janitorial Express (Pioneer Products Ltd t/a) has been paid in full by the buyer of goods supplied by Janitorial Express (Pioneer Products Ltd t/a), such goods remain the property of Janitorial Express (Pioneer Products Ltd t/a), although the risk therein passes to the buyer at the time of delivery and the buyer shall indemnify Janitorial Express (Pioneer Products Ltd t/a) against any losses or damage thereto and without prejudice to any other remedies. It is agreed that Janitorial Express (Pioneer Products Ltd t/a) may repossess their goods/property any time from the buyer. Janitorial Express’s (Pioneer Products Ltd t/a) agents and servants may enter any premises in which the goods/property are situated to recover all goods/property belonging to Janitorial Express (Pioneer Products Ltd t/a) without a court order. All new accounts will be subject to Directors’ guarantees unless otherwise agreed. If a credit account is required please ask for a credit application form at which time two trade and bank references will be required. Orders can be accepted on C.O.D (cash on delivery) basis if necessary. The terms and conditions of sale and all disputes arising out of or in accordance with shall be construed with or governed by English law. This agreement is subject to all conditions set out and constitutes the entire agreement between the customer and the seller; no alteration waiver or modifications of the terms of this agreement shall be valid unless signed by a director of the seller.